The original lineup of Killing Joke — Jaz Coleman, Kevin “Geordie” Walker, Martin “Youth” Glover and Paul Ferguson — has plans for a busy 2012, with recording underway for a new studio album due early in the year, an elaborate live CD/DVD package set for release in January and a U.K. tour set for March. 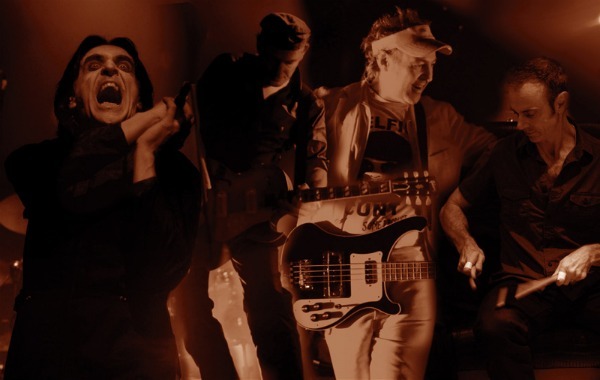 While a release date hasn’t been set for the as-yet-untitled album, Killing Joke has announced an 11-date U.K. tour in March to support the record, with a promise of European dates to follow. The trek opens March 6 in Exeter and wraps up on March 17 in Oxford (see full dates below), and will be the band’s first outing since canceling a planned U.S. tour earlier this year. Finally, in January, Killing Joke will release Down By the River, a live document of the band’s April 1, 2011, concert in London — recorded at Geordie’s direction, unbeknownst to the rest of the band — that will be available in a number of formats, including a digital download, a 2CD/1DVD, double-vinyl and various autographed permutations (see tracklist below). Check out the band’s Pledge Music page for full details. wow, i hope they can jump over to the US! I hope u guys are comming to the US so I can bring my boyfriend to a Killing Joke show. He is a huge Killing Joke fan and has actually met Jaz and had pic’s taken with Jaz. My boyfriend was in a Punk band that toured all over the world. So he does know Jaz.